Arrested seven people in connection with the death of Stephen Mallon, the 49 year old Briton who died last week after a street fight in Cómpeta in the early hours of Friday 5th June. Mr Mallon suffered severe head injuries after falling from a five metre-high wall during the fight, and spent 12 days in a coma before he died.The brawl between opposing groups of British and Spanish youths is believed to have involved up to 30 people, and Diario Sur reports that the Civil Guard identified 10 of them last week. The seven suspects were taken into custody on Wednesday morning and are, according to Europa Press, between 20 and 25 years old. No nationalities have been given in reports.The fight took place outside the Pub La Estrella, and it’s believed that Mr Mallon was injured after going to help his 16 year old son and nephew when they became involved in the punch-up. It’s understood, according to the local Mayor, José Luis Torres, that the Mallon family owns a house in Cómpeta, which the Mayor described as a peaceful village currently shared by 36 different nationalities. Four Russians have been arrested during a police operation on the Costa del Sol Spain, after injecting their victim with what they maintained to be an experimental KGB virus, claiming he would die in 24 hours.The kidnappers seized a Russian businessman in a street last week in Estepona; a Spanish resort lying 20 kilometres (13 miles) to the west of Marbella. Marbella and it's glitzy neighbour, Puerto Banus plays host to the rich and famous and is the hedonistic playground for the rich and famous. The Russian crime gang threatened their hostage with the so called ‘deadly’ virus to scare him into paying a ransom amount of 12000 Euros ($16500) in return for the antidote, otherwise he would face death within 24hours according to a local report. The victim did endure some adverse symptoms including fainting, fever and vomiting. Their methods have been branded as bearing the typical hallmarks of a KGB style 'kidnap.' Armed Police officers from the organized crime squad in Málaga were on standby when the gang went to collect the ransom payment in San Pedro, just a few miles west of the notorious crime den of Marbella. 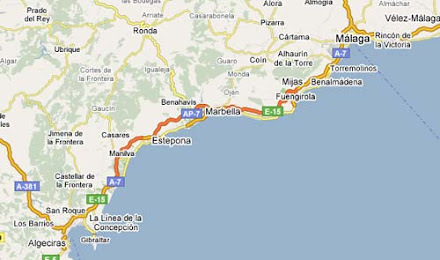 The four Russians, three men and one woman, aged between 24 and 57, were arrested; three in San Pedro and one in Mijas. The gang now face charges of kidnap, torture and the illegal possession of firearms. This is the second kidnapping carried out by Russians in Estepona this year. A businessman’s wife and daughter were taken for a two million € ransom at the end of March. Police managed to release the captives in that case and made two arrests. The Russian mafia has been gaining pace in Spain, particularly in the Costa del Sol region due to the expanding property market, which has provided an opportunity for illicit gangs to launder money. It is now a week since the mass fight in the Axarquía village of Cómpeta last Friday night resulted in the British resident, 49 year old Stephen Mallon, being admitted to the Carlos Haya hospital in Málaga in a coma. Reports indicate that he was called to the aid of his 16 year son and nephew, who also suffered a broken nose and arm in the fight outside a local disco pub, which was allegedly between a group of foreign and Spanish youths.We have received reports that the police took some two hours to arrive at the scene, as the local police station is closed at night, and also that when the ambulance arrived at the scene the medics were not allowed out of the vehicle to attend to the victim. There are conflicting witness reports claiming either that he was hit with a bottle which left him unconscious, or that he fell, or was thrown over a wall to a five metre drop.Cómpeta is a small village where everyone knows everyone else, but for now nobody is speaking publically about what has happened. There were obviously dozens of witnesses to the fight but nobody wants to talk on the record. Even the Mayor, José Luis Torres, has declined to make a statement, although some local residents have said that fights have been a regular weekend event for some time, and that the venue where the fight took place should not be open in the small hours. The fight was at 4am outside the La Estrella pub, close to the Hotel Balcón de Cómpeta. One witness told Diario Sur that the fight started inside the bar, but that the owner threw the people outside. Reports indicate as many as 30 people were involved.The Guardia Civil are still to make any arrests in the case and the local press reports that the investigation is progressing only slowly. Autopsy carried out on the body of 20 year old Avril Flanagan, the Irish girl who was stabbed to death in a hotel apartment in Orihuela Costa last Friday, has revealed that she was stabbed a total of 40 times, Diario Información reports. The man in custody for the murder is her 24 year old ex boyfriend, named by the Irish Times as Alan Daulby from Liverpool. He’s reported by Información to have told the Guardia Civil that he remembers nothing and also refused to make any statement to the investigating judge.The paper says witnesses and friends questioned by detectives claim the victim was due to fly back to Ireland on the day she died to escape the unwanted attentions of the man now in custody. He is said to have refused to accept their relationship was over, which Ms Flanagan is believed to have ended the week before she was murdered. Civil Guard officer was arrested by colleagues in Melilla this week as he tried to board the Almería ferry with more than 100 kilos of cannabis hidden in his car. Officers found 128 kilos of cannabis pollen hidden in the rear door panels of the vehicle and he now faces a public health charge.The officer is based in Melilla and although still officially on active duty is reported by Europa Press not to have worked for some time. 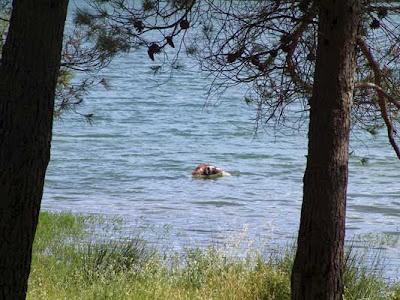 Guardia Civil recovered the headless body of a man floating in the Regajo reservoir, in Jérica, Castellón on Sunday. The body was found by some youngsters who were canoeing on the water, and have been tied down to a block of bricks. First indications were the body had been in the water for several days and the investigation remains open. gang ferried large consignments of hashish from Morocco. Spain’s Guardia Civil and Agencia Tributaria claimed that four Gibraltar-registered companies were allegedly used to provide logistical support to a gang of drug smugglers based in the Campo de Gibraltar and the Costa del Sol.as they revealed details of a major investigation that led to 12 arrests and 16 tonnes of hashish being seized.Operation Leasing began over a year ago when the two agencies suspected that the gang was relying on legitimate companies to provide backup for their clandestine business.They used a series of legitimate companies in the marine business as fronts to provide vessels for their smuggling operations. Several boats seized during drug operations were later claimed back by these companies on the false pretence that they had been stolen, or had been leased out. In this way the smugglers recovered the vessels and further blurred the paper trail. The companies operated a legal front too and were involved in money laundering, according to a joint statement by the Guardia Civil and the Agencia Tributaria. The person believed to be the head of the gang – identified only as H.H.G.V - relied on five companies. One was a law firm in Algeciras, while the other four were allegedly registered in Gibraltar.The Gibraltar companies were not named and were described only businesses involved as in the sale, purchase and leasing of pleasure vessels.“This corporate web provided the appearance of legality to his illicit activities in the Campo de Gibraltar,” the statement said. The gang ferried large consignments of hashish from Morocco.Over the past year, Spanish law enforcement agencies have seized 16 tonnes of drugs linked to the group.They have also confiscated 10 vessels linked to the companies, as well as numerous mobile and satellite phones and six computers. Properties have been searched in Algeciras and La Linea and several bank accounts have been frozen. Jimmie Willis, was described as “cold and calculating” by forensic psychologists, has been found guilty of Deborah Hatto murder. Deborah Hatto, from Crawley, was stabbed to death as she slept in her apartment in Coin, near Malaga, Spain, last June.The mother's blood-soaked body was found in bed by her 10-year-old daughter after she was stabbed as she slept. Her German boyfriend Jimmie Willis, who was described as “cold and calculating” by forensic psychologists, has been found guilty of her murder. Ms Hatto's daughter, who was just ten at the time, told a Costa Del Sol court via video link how she discovered her mother's lifeless body on the eve of her 42nd birthday. Forensic scientists, who examined her body, said there was no sign of a struggle and Ms Hatto was most likely asleep in bed when she received the single fatal stab wound. The murder weapon was discovered next to the mother’s body. Officers from Spain's Guardia Civil said Willis, 60, originally from Frankfurt, had claimed he struck because "he couldn't take it any more." They also said they found traces of her blood on his neck, behind his ear. The Scientific Police of Madrid stated that the wound inflicted on the victim coincided with the knife found at the side of the bed. But in court, Willis said the biological father of Ms Hatto's daughter was responsible for the killing - a claim that was rejected by the court. Willis' lawyers also tried to persuade the jury of five women and four men that he should be charged with unlawful killing with extenuating circumstances. A public prosecutor called for him to receive a 15 year sentence for unlawful killing, but the jury agreed with Javier Florido Martin, representing Ms Hatto's family who said the charge should be murder. Mr Martin said: “I maintained from the outset that this was a matter of murder and not unlawful killing. “The forensic psychiatrists stated that Jimmie Willis was in a perfect mental state, that he was not clinically insane and that he knew perfectly well what he was doing. “The forensic psychologist - in response to questions asked by the prosecution – described Jimmie Willis as 'cold and calculating', 'insensitive' and 'with no remorse whatsoever'. “The jury reached a verdict and declared the accused guilty of murder with no extenuating circumstances. They were 100% in agreement with the family.” Keen traveller Ms Hatto, grew up in Horsham and moved from Crawley to Spain with her daughter three years before she was brutally killed. Willis is due to be sentenced next week. Dutchman is accused of fatally stabbing his girlfriend in Malgrat de Mar near Barcelona on Sunday. 26 year old Dutchman, named as Ratko H. is accused of fatally stabbing his girlfriend in Malgrat de Mar near Barcelona on Sunday.The attack took place in the street just before 2pm with the victim dying shortly afterwards, and then the aggressor injured himself. He is now in a serious condition in hospital. Reporting restrictions have been put on the case which is being investigated by the regional police, Los Mossos d’Esquadra. Spanish lawyer forced to move from his Marbella office to a new base in the UK capital owing to pressure from the Civil Guard investigation. lynched to death on the Avenida del Pacífico in Málaga on Wednesday night. man who police believe had moments before attempted to rob a games arcade in the city was lynched to death on the Avenida del Pacífico in Málaga on Wednesday night. It happened a hundred metres from the arcade on Calle La Hoz, El Mundo reports, where witnesses say they saw a mob savagely attacking the man at around 11 pm that night.The weapons used are believed to be a hammer and broken paving stones. The victim was already dead when police arrived at the scene, and is identified by El País as M.B.R., a 37 year old Spaniard.Latest reports indicate that police have arrested two men in connection with the attack. Two British men have been arrested by the Guardia Civil in Zurgena on the Costa Almeria for smuggling drugs through the post .The police became aware that the postal service was being used for cocaine smuggling and began investigations to find the culprits .Last week they targeted a package which had been sent from Argentina to a property in Zurgena .The house had no occupants .The house was then watched until someone came to collect the package , with false identity papers .They arrested two expats , a 30 year old and a 27 year old who live in Roquetas de Mar. The package was a gift wine case and in the base of the package was enough cocaine to make at least 1500 units for sale at local leisure spots along the coast . It appears that this could be a common way for drug traffickers to acquire their drugs . International cemetery in Benelmadena on the Costa del Sol has been subject to a series of break-ins into several niches .Investigations have resulted in the arrest of a man who is practitioner of the African based religion Santeria .The suspect is Cuban and it is believed that he has stolen bones and skulls for use in voodoo activities .He is a local man .The missing bones have not yet been recovered . The National Police were called in when the person who cares for the cemetery discovered that some of the niches , six in all , had been tampered with .Three were untouched but the other three had had bones removed .None of the bodies had been interred recently .This religion was carried to the Caribbean by black slaves from Africa .The religion has changed since it was first introduced , mainly to disguise it from Christian religions , particularly catholicism .